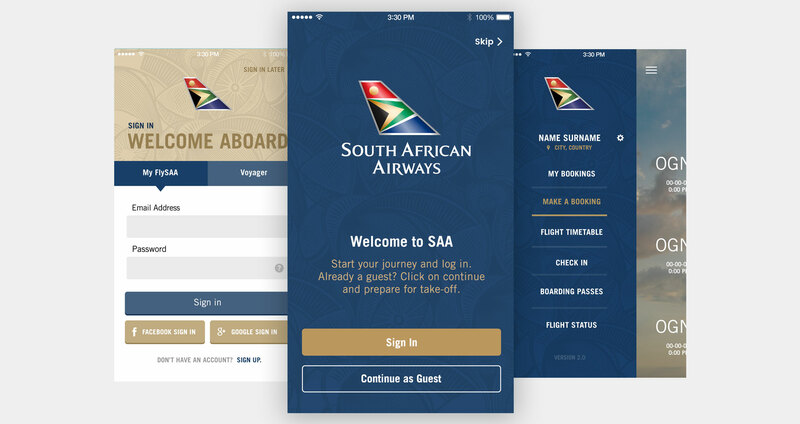 When SAA approached us their request was straightforward - to redesign their existing smartphone app, giving it a modern look-and-feel that would bump their customers’ user experience up a class. SAA asked for the app to be designed in such a way that it would be as intuitive and easy as possible for their customers to use. This meant using modern UI practices and methodologies that would ensure that the app looks appealing, works efficiently and enables their customers to manage their flights and bookings seamlessly. To create this experience, the existing app required new functionality on top of the existing one while still needing to meet modern navigation and UI standards. SAA’s previous app was created in HTML5, which meant that functionality was limited for the type of experience SAA expected for their users. Our solution to this was to rebuild the smartphone app natively, ensuring that we could create a more sophisticated user experience with a revised look-and-feel.